Earlier this year Craig described how we worked with Seneca Label to push their internal brand and language to better reflect their can-do attitude and energy. This led to a new motto and tagline that better captures their voice. 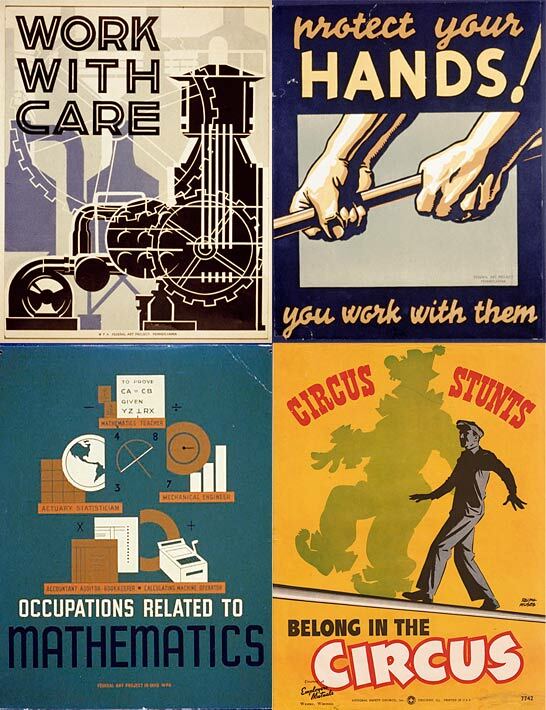 These branding explorations also paved the way to a bolder, more creative design style that takes its inspiration, in part, from WPA-era posters. These posters tended to use clean, flat blocks of color and a strong graphic approach. This was largely pragmatic; fewer colors and simple designs lent themselves more easily to the screen printing process, allowing for cost-effective mass reproduction and easier dissemination. Need a quote? You can expect a speedy response. Want the best label? We go above and beyond – even when it hurts. Unusual request? We develop new processes to make your concept a reality. Others telling you no? We tackle the jobs that they won’t. Someone else botch your job? We’ll clean up the mess. Our first step was brainstorming ideas to match each of the five bullet points. Again, we used the WPA posters as inspiration and began sketching. Once a preliminary sketch was determined to have merit, a quick digital mockup was created and sent to the client for review. Some early ideas were “misses.” The concepts either weren’t on the mark, were too weak or too much of a stretch, or just otherwise fell flat. For example, a sketch showing a worker putting on goggles appeared too serious and perhaps a bit scary. An early concept for “even when it hurts” showed a bandaged arm giving a thumbs-up sign, which was amusing, but was abandoned in favor of a more iconic and powerful Atlas-like pose. But in a short amount of time we had five solid concepts. 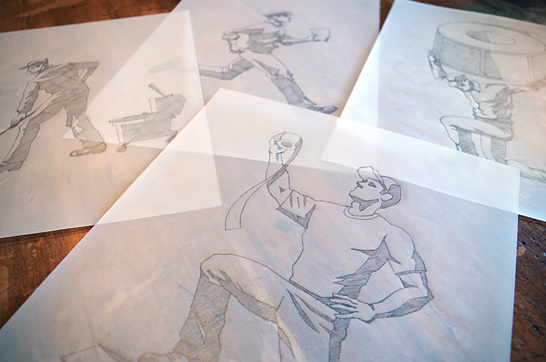 Once those sketches were approved, they were refined and used as a basis for final pencil drawings. The drawings were scanned and imported into Adobe Illustrator in order to create vector versions of the artwork. This meant that the final illustration files would be scalable to any size without a loss of fidelity. The vector process consisted of tracing outlines on top of the scanned pencil drawings, refining those outlines, and then transforming the outlines into the solid colored blocks and shapes of the final illustrations. The final step was creating an Adobe InDesign print file that combined the vector artwork with typography and the new Seneca Label logo. We decided that one of the fonts used for the logo, Addressotype Slab, would be perfect for parts of the headlines. On the back of the cards, it was also used for drop caps at the beginning of paragraphs. In the end, the project was very labor-intensive, but certainly worth the perspiration. Like Seneca, Cassel Bear isn’t afraid of hard work. And because we didn’t take any shortcuts, the client now has original illustrations that can be repurposed in a number of new and creative ways. See the results for yourself.